Motherhood is by all means one of the strongest forces in the natural world. Mothers from all species are like shields to otherwise completely vulnerable babies. Thanks to mothers, helpless babies are kept safe, fed and loved. There is no doubt that babies need their mothers, both physically and emotionally. But the story doesn't end there, as mothers need their babies as well. Most mothers, human or not, would find it psychologically tormenting to not be able to mother their babies. In essence, mothers need their babies just as much as their babies need them. This is why the next 5 images should inspire any mother to make kinder food choices and become an advocate for animals. These mother pigs and piglets are seeing the outdoors for the first and last time in their lives. They came from an intense factory farm where diseases spread rapidly. As a result of some disease, the South Korean government demanded that farms exterminate the pigs. Accordingly, the farms decided on the cheapest way to kill everyone at once. And the most heartbreaking part? Mothers had to crush their own babies to death. Can we even imagine how these mothers felt as they were forced to crush the limbs of their own babies? Sadly, live burials of farmed animals are common throughout the world, including in the US, Australia and other places. A baby lamb desperately tries to get back to his mother. The baby lambs were taken from their mothers to be slaughtered for the traditional Easter. This heartbreaking photo was taken on a dairy farm in Germany. The dairy industry separates and prevents babies from being with their mothers, in order to take the milk that the mothers make for their babies. All male lambs are sent to slaughter, since they will never be able to produce milk for the dairy farms. Why can't I be with my babies? Right after birth, these twins were placed in a cage, so the mother cow won't nurse them. The devoted mother stood all night by the cage, having to watch one of her babies die without being able to comfort him. For cows, a twin pregnancy is very hard, often leading to miscarriages or the birth of weak or deformed calves. 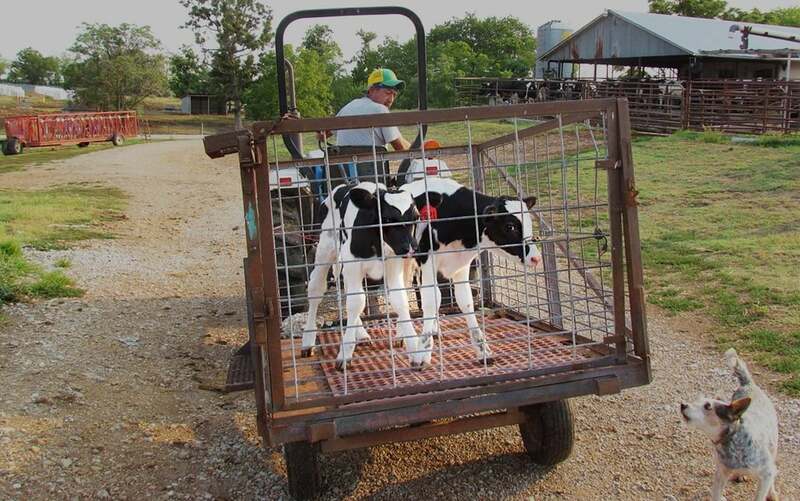 Giving their fragile state, twins need their mothers even more than other calves do, but dairy farms make no exceptions. For this mother, the only time she got to be near babies without a cage surrounding her, was in her death. On pig farms, mother pigs are constantly impregnated, around 2-3 times per year. Once they give birth, they're put in “farrowing crates” that are designed to prevent them from moving. Some mothers don’t survive the non-stop pregnancies and the intense confinement. But what are babies doing in the trash? All small or weak baby piglets are killed on the farm itself, for economic reasons. The workers identify the vulnerable piglets and smash their heads against concrete. The helpless mothers who are inside cages, are left to scream and watch as their babies get killed. In this picture we can see a mother cow reaching out to lick her baby for the last time, before they are separated for good. Since dairy farms don’t want the babies to nurse from their mothers, they take them after birth and the males get slaughtered shortly after. Mother cows, especially first-time mothers, are known to cry for days for their lost babies. In order to make this world a kinder place for mothers and babies, try to be vegan for 22 days. We highly recommend to join Challenge 22+ for both free guidance and support. Kinder World is a non-profit initiative dedicated to encouraging compassion for animals. You can reach us at kinderworld.org@gmail.com.